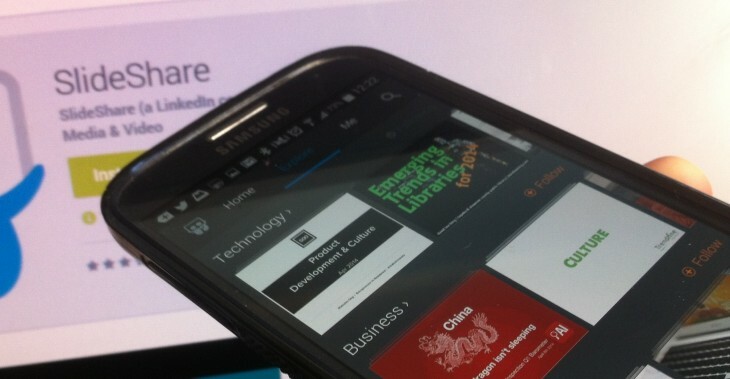 File and presentation-hosting platform SlideShare has finally delivered a native mobile app, kicking off today with Android. Launched initially in 2006, SlideShare lets users upload PowerPoint, PDF, Keynote or OpenDocument files to share publicly or privately. LinkedIn acquired the company in a $119 million deal back in 2012. While SlideShare has typically always worked well on the mobile Web, a glaring omission has been its absence from Google Play and Apple’s App Store. While one of these facets has been remedied, if you’re an iOS user you’ll have to sign up as a beta tester for now. Once you’ve signed in with your LinkedIn, Facebook or SlideShare credentials (interestingly, Facebook takes precedence here over your actual SlideShare login details) you’ll notice that it doesn’t let you create or upload files. This is all about following topics, viewing presentations, saving for offline access and sharing your favorites. It’s actually very nicely designed, and lets you swipe sideways through a deck without leaving the main presentations feed – to view it full-screen, you just have to tap. However, the Android launch isn’t all that’s been cooking at SlideShare towers. As noted already, SlideShare for mobile is all about viewing and sharing – presentations are still generally created using desktop- or Web-based software. As such, SlideShare now lets you generate a preview of how your handiwork will look on various mobile devices in any standard desktop browser. Today also heralds a completely overhauled mobile Web app. Users can now swipe from slide to slide within a presentation, similar to how you can within the app. And SlideShare has made it easier to share presentations directly from your mobile, with Android users now able to send their favorites via SMS, while iOS users can channel into WhatsApp.